(CNN)Advanced planning and authorities' quick reaction to a powerful 8.3-magnitude earthquake minimized the severity of the disaster that struck off the coast of Chile, triggering a nearly 16-foot wave on the shore in the Coquimbo Region. About 1 million people evacuated ahead of the tsunami wave. Authorities said at least 10 people died and one person is missing. The quake hit Wednesday night, with its epicenter 46 kilometers (29 miles) west of Illapel, according to the U.S. Geological Survey. Cindy Wells our Director for Global Missions here at the Western Iowa Synod ELCA has been in contact with Bishop Izani Bruch of the Evangelical Lutheran Church in Chile. This is the e-mail she received from him in refer to what he has encountered. When the sun come up, to see the damage of the earthquake that hit the area north of our country, we give thanks to God for his great mercy and care for us and us. We deeply regret the loss of the lives of five people, we express to the families our condolences, and we pray for peace and comfort of God accompany them. One more time we are facing a difficult time as a country by a natural disaster where we are called as to put into action our solidarity and give testimony to the grace and mercy of God. The Red Cross is organized in all regions of our country. That our aid in this first time can we arrive at the centres of collection of the red cross. A blessed day to all and all. Let us hold them in prayer and thoughts through this time. ​Your body is a gift from God. Do something every day to wake it up and keep it strong. It's OK to take a break. When you re-charge, your congregation will get you at your best. You don't have to go it alone. Find someone you trust to be your accountability partner as you work on making a healthy habit stick. You know benefits are costly. Why not thank your congregation for these gifts-and share how you use them wisely? We thank you for your gifts of time and resources and our very bodies. Grant that we may wisely use all you have given us, caring generously for others and for ourselves, that all may enjoy the goodness of your creation; through Jesus Christ, our Savior and Lord. Marietta Nelson-Bittle from Saint John's Lutheran Church, Council Bluffs sent us this wonderful picture of her daughter Maeve at Proclaim Story Day at the ELCA Youth Gathering in Detroit. 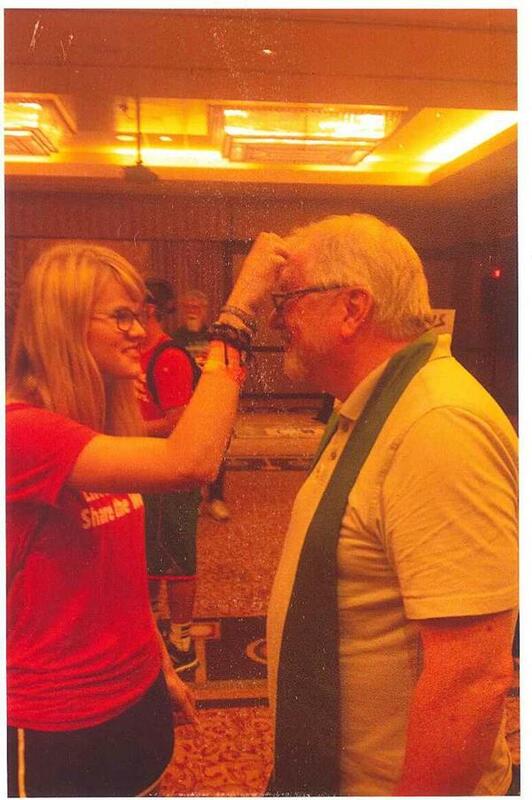 Maeve is photographed blessing Bishop Rodger Prois. Such an awesome picture of our youth in the Western Synod! I have incredible news! 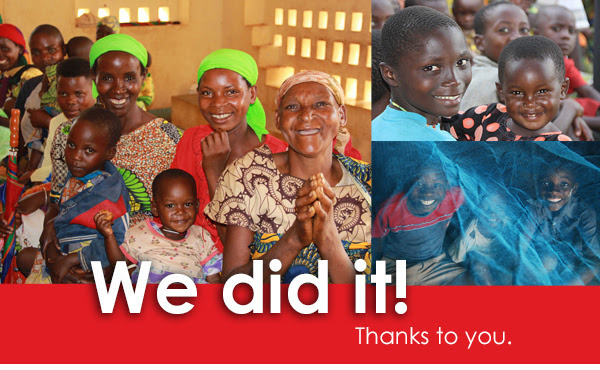 The ELCA Malaria Campaign just reached its fundraising goal of $15 million! Thank you for being a part of this monumental milestone and helping us protect countless lives from this preventable, treatable disease. We couldn’t have done it without you! Five years ago ELCA members, congregations and synods came together, dreamed big with our Lutheran companion churches and partners, and set out to raise $15 million for malaria programming. Today we celebrate all that we have accomplished together. Working with our Lutheran companions and partners in 13 African countries, we have brought about lasting change. But our work is not over. While the ELCA Malaria Campaign will officially come to an end on Jan. 31, 2016, our commitment to ending deaths from this disease will not. In the coming years, support to our companions and partners to address malaria will come through gifts to ELCA World Hunger, which has a long history of supporting health-related work. Without you, none of this would have been possible. Thank you for your prayers, your partnership and your generosity. Please register by September 21st! Fall classes will be underway in less than two weeks, but it’s not late to register! Our exciting new core class,Worship 101, begins on September 28th, with the first of eight Monday evening classes. Five really interesting and dynamic instructors will teach this broad survey course. This class meets in Minneapolis, but offers a distance learning option. For more info and registration click here. Our first technology training class, Church Audio Basics, will be Saturday, October 3rd in Maple Grove, MN. This introductory course will provide participants a better understanding of how sounds systems work, how to use them effectively in worship, and teach basic troubleshooting. Send us your Sunday morning audio engineers! For more info and registration click here. Saint John Lutheran Church in Council Bluffs, IA is hosting a Vibrant Faith "Do What Matters" two day event on Sept. 29 & 30. Leif Kerhwald will be leading and facilitating the event. It is a wonderful opportunity for leaders and lay teams to learn about and focus on faith formation. It is very affordable, $99 per person, and applicable to all leaders. Invite a friend or colleague to join you!! ​All the information and registration can be found by clicking below!! ​​Join us on October 31st .....as we discuss and learn about forming faith everyday and everywhere. This Faith Formation event is being sponsored by Vibrant Faith Ministries and the Western Iowa Synod. We are excited to have Jim LaDoux join us as our presenter. This event will be held at Our Savior's in Council Bluffs. It will begin at 9:00 am and conclude at 12:00 pm. and it's free to all participants. Thanksgiving is coming in October this year! Well, at least it is in the Western Iowa Synod as we give thanks to God in our annual Thanksgiving event. But shouldn't Thanksgiving be more than just one day? Last year, the Synod sponsored the first ever "Thankfulness event" where people throughout the Synod came to hear stories of how God is doing wonderful things through the church. We gave Thanks for all that God has done and continues to do because of the generosity of members. This year, the Synod is offering 8 opportunities for you to come and learn about the ministries that are being done in the Synod and throughout the church because of your generosity. Join us in giving thanks for all that God is doing through the church! Mark your calendars and attend the thankfulness event closest to you! Watch for more details coming soon about the meals and contests! ​ has available one more $3,000 “Educational Debt Reduction Scholarships” in 2015 for pastors in their first years of ministry in the Western Iowa Synod. If you would like an application form or more info,contact Trinity at pastorbarbk@hickorytech.net. Applications are due in by October 15, 2015, to be awarded by November 15, 2015. Those who have applied in the past may re-apply. The Hope Leadership Conference is a two-day, inspiring and transformational experience, aimed at building servant leaders in the church. Hosted by Lutheran Church of Hope in West Des Moines, IA, the conference keynote speakers range from pastors, bishops, religious scholars, international missionaries and much more! We believe strong Christian leaders are essential to the positive growth of teams, churches, organizations, communities… and the world! So join us for a conference where together, we will help prepare church leaders to more effectively reach out to the world around us and share the everlasting love of Jesus Christ!